The obvious focal point of Niacin is bassist Billy Sheehan – Sheehan’s musical history is stellar and impressive. Generally, hearing Billy Sheehan leaves most music fans wide-eyed in amazement. You can understand how it’s practically overwhelming to see how he actually covers a broad spectrum of technique to produce the sounds as he does. As fundamental as Billy Sheehan is to the marketing of Niacin, it’s equally impressive how keyboardist John Novello is the melodic force behind the Niacin sound. Just watching Novello play the organ was a treat – his playing seems effortless. And it’s all the more impressive given the choice of largely forgotten Hammond B3 organ. Dennis Chambers has to be one of the most overlooked drummers in music – ever. Even in his native Baltimore he seems to be unknown. Physically, Chambers’ playing isn’t flashy, but it is tight and “in the pocket” to borrow the old blues/jazz phrase. Witness his solo in the middle of “Birdland” to get a sense of how good Chambers really is. The visuals on “Live In Tokyo” are pretty simple. One well-lit club, one camera on the entire stage, and one camera on each musician. It doesn’t make for exciting viewing, but I can say it was the first DVD I “watched” solely to hear the music. Niacin is a lock-step trio of virtuosos creating music that transcends definition even as it borrows heavily from traditional jazz and ‘70s progressive rock. Not all metalheads or hard rock fans will appreciate what Niacin has to offer, but “Live In Tokyo” captures both the spirit and talent that Sheehan, Novello, and Chambers have as individuals and as a group. 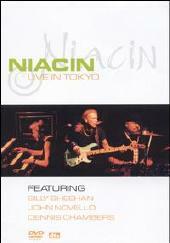 Niacin: Billy Sheehan on bass, John Novello on Hammond B3 organ, and Dennis Chambers on drums. For more information visit http://www.niacinb3.com. 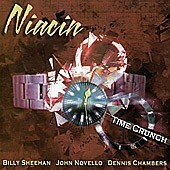 Niacin's fourth studio CD, "Time Crunch," is a rollicking good listen. While I am not familiar with Niacin's previous releases, I do know that the trio has killer chops and stellar reputations to match. However, most Rough Edge readers will likely only be familiar with bassist Billy Sheehan from his stints with Talas, Mr. Big, and David Lee Roth. Rough Edge readers won't be too familiar with either John Novello or Dennis Chambers. Organ player Novello has played with numerous jazz oriented outfits while drummer extraordinaire Chambers is one of the best drummers in the business having played in numerous jazz, funk, hard bop, and fusion projects. Niacin cover a lot of ground musically on "Time Crunch." At times Niacin sound like a stripped down version of Steely Dan during their funkier moments. At other times Niacin hint at prog-like tendencies despite the limited structure of their chosen instrumental arrangement. Then Niacin will hit you with blissfully rocked out tunes that never waver into either the funk/jazz genre or prog-rock genre. Although there are no guitars on "Time Crunch" I hear a lot of the vibes that the late, great Danny Gatton used to capture on his records. That vibe is a usually upbeat vibe that is buoyant and jumpy, but also capable of delving into many of the not-so-happy human emotions. Loud and dirty guitars are usually a pre-requisite for inclusion on Rough Edge, but Sheehan's funky bass, Novello's broad palette of key tones, and Chambers' downright rock-solid drumming is a lethal combination. However, Novello often runs of a flurry of notes on his synths that have been sampled from guitars which frequently give the impression of a guitar being played on "Time Crunch." Many of the tracks here hit the five-minute mark or more giving the band plenty of room to explore each song's nuances and shades of color without going too far in the progressive direction. However, as a nod to prog-rock giants King Crimson the band covers the classic "Red" in epic fashion and the band covers the Jan Hammer-penned, but made famous by Jeff Beck tune "Blue Wind" that revels in the song's huge rock sound. "Time Crunch" is a thoroughly enjoyable listen, even if it isn't something that I'd normally listen to or select to play when I've got nothing better to do. Under normal circumstances "Time Crunch" would get a minimum of three chainsaws, but the lack of guitars takes it down a notch. Fans of Dream Theater and the prog-rock genre in general will like Niacin. "Time Crunch" was produced by John Novello and Billy Sheehan. Niacin is John Novello on keyboards, synthesizers, and organ, Billy Sheehan on bass, and Dennis Chambers on drums. For more information visit http://www.niacinb3.com/.